Restoring from iCloud backup taking forever, how to fix it? Restoring from iCloud Backup Taking Forever, How to Fix? "The restore from iCloud is going very slowly. I can see in the realtime bandwidth reports on the NOC and there is next to zero traffic for iCloud, WHY?" iCloud helps in creating a backup of contents from the phone or any other device. A great many users prefer to back up their iPhone via iCloud. 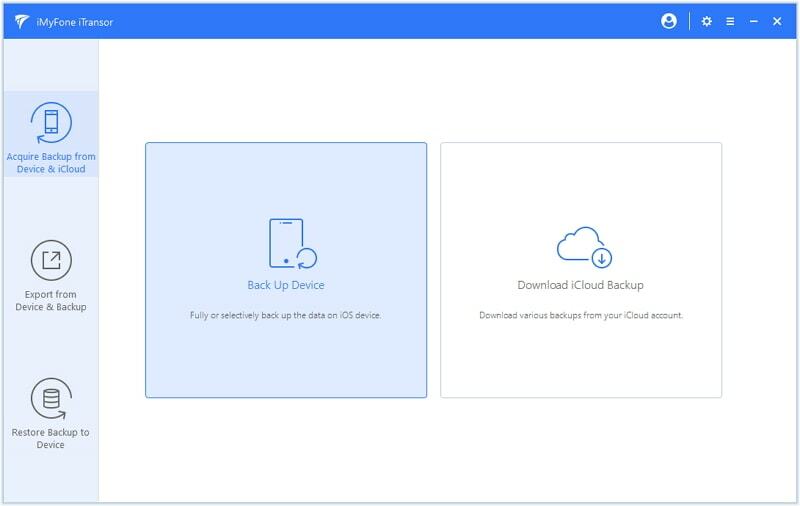 iCloud can perform a backup whenever and wherever as there is no need to connect your device to computer when backing up with iCloud. Besides, iCloud will back up automatically when the device is turned on, locked or connected to WiFi. However, it is always reported that restoring from iCloud backup taking forever when iOS users try to restore their iPhone from its backup. It might be caused by several reasons, now this post will walk you through different reasons that cause iPhone restoring from backup taking forever and the ways to fix it. Part 1. Why is the iPhone Restoring from Backup Taking Forever? Part 2. How to Fix iPhone Restoring from Backup Taking Forever? Part 1.Why is the iPhone Restoring from Backup Taking Forever? You may wonder how long should it take to restore from iCloud backup. In fact, even with the strongest network connection, it might still take hours to complete the process. If it seems to go on forever, you need to think about if something went wrong. Most of the time, such a situation occurs because of the instability of the application in restoring the content from the backup file. In some cases, the reasons are due to poor battery life, issues with applications present on the backup file or during iOS update. Although the reasons are unknown, sometimes, many applications, tend to refuse to set up on the new iPhone. 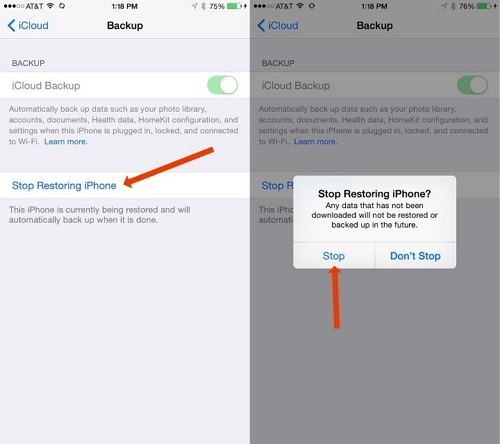 Can You Stop iPhone Stuck iCloud Restore? If the restoration process is taking forever, the process got stuck due to a glitch and will not continue no matter how long you wait. A better way is to stop the process manually. As the restoration is stuck, you will have to revert the process manually. Step 1. Sail to the Settings application on your iPhone. Step 2. Scroll down to find iCloud from the list and tap the same. Step 3. 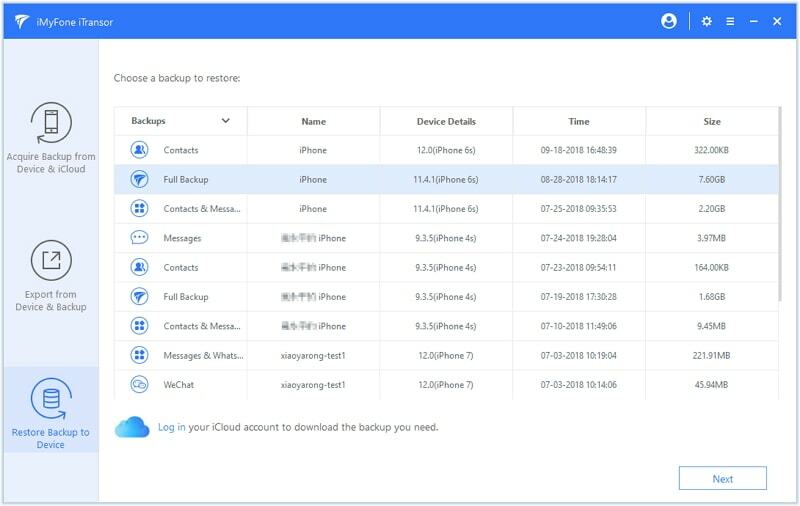 Once inside the iCloud menu, scroll the list to see Backup. Click the same, and ensure that it is active already. Step 4. In the same window, click "stop restoring iPhone" option. Selecting the option will halt the restoration process. You will not be getting contacts or other applications on the new iPhone. It is preferable to perform a factory reset and freshly reinstall the iOS operating system. As you have seen from the steps mentioned about that restoring an iPhone from iCloud backup is tedious, iMyFone iTransor (D-Port Pro), an iPhone data backup and restore tool will be of great help. 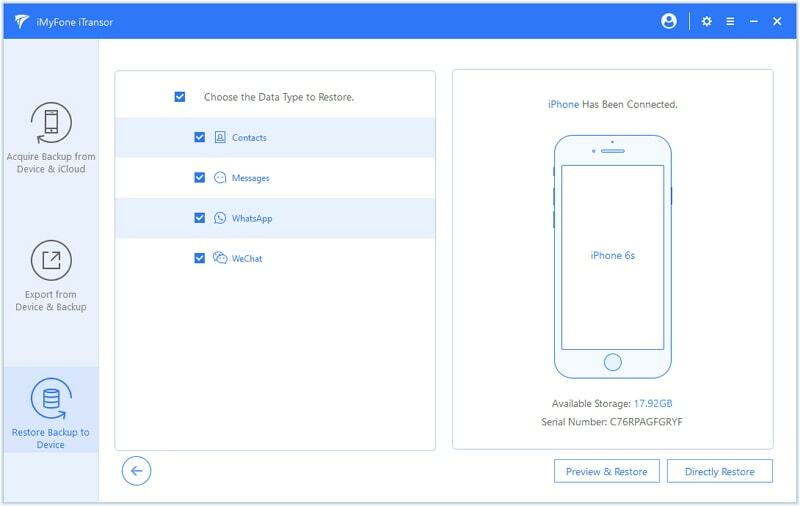 It allows you to quickly and selectively restore Contacts, Messages, WhatsApp, WeChat from iCloud without overwriting data on your device. In addition to restoring data, it is also capable of backing up iOS devices and exporting almost all data from the device or from the backup files as HTML or CSV files. Step 1. You will need to download an iCloud backup from the iCloud account or make a new backup using iTransor firstly. Step 2. After the download or backup, click "Restore Backup to Device" option and the backup files you just made listed as below. Choose an backup that you want from the list. Step 3. Mark the data that you need and choose the "Preview & Restore" or "Directly Restore ". Step 4. 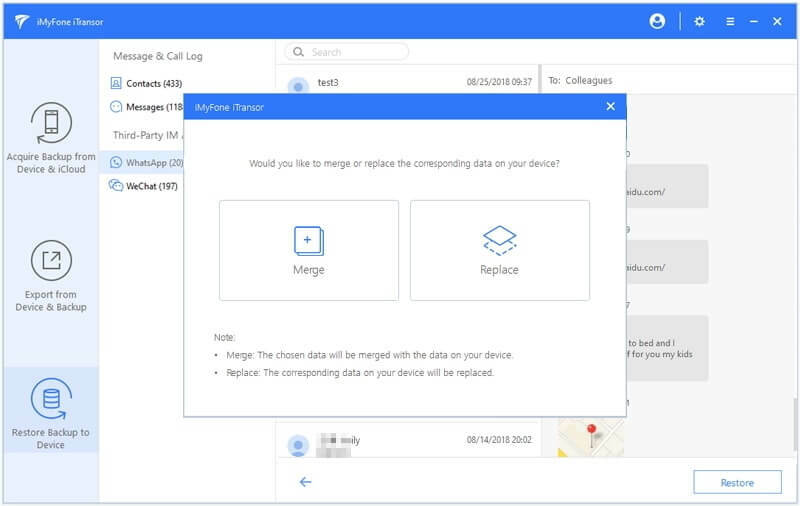 You can also choose to merge or replace the data on your device. After restoring, you can view the iCloud data on your device. If you wish to avoid hurdles during the restoration of your iPhone, choose iMyFone iTransor as the platform, which gives you greater control and ability in transferring data from backup files.